Make sure that you vacuum your rug thoroughly, on a regular basis. This will not only remove dirt and grime but re-vigorize the fibers of the material. Also, invest in a good vacuum cleaner – it’s really worth it. Rotate your rug regularly (between 6-12 months). This will ensure even wear. 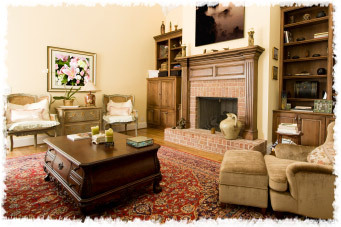 Have your rug professional cleaned at least once a year, to keep it in optimum condition. If you spill something on your rug, wipe it up immediately, using a clean white cloth. The longer you wait before taking action, the harder it will be to get the stain out. When trying to remove a stain yourself, before you do so carry out a spot test on a small, inconspicuous area, to check the results. Make sure to place a rug pad under your special piece – this will prevent dirt, wear and tear and help you from slipping. Keep a doormat outside your house – it’s an extremely effective way of minimizing the dirt and grime that will inevitably be trodden into your rug on a egular basis. Move your furniture around occasionally – this will help minimize indentations in your rug. Keep your rug out of the sun, as much as you can, or at least consider sheer drapes, to prevent fading. Finally, if your rug is badly stained, torn or ripped, call a professional as soon as possible. A good repair/restoration service will save you time and worry and, in the long run, money too.